Rachel Joyce, has written over twenty original afternoon plays for BBC Radio 4, and has created major adaptations for the Classic series and Woman’s Hour, as well as a TV drama adaptation for BBC2. In 2007 she won the Tinniswood Award for Best Radio Play. Joyce moved to writing after a twenty-year career in theatre and television, performing leading roles for the RSC, the Royal National Theatre, The Royal Court and Cheek by Jowl; and winning a Time Out Best Actress Award and the Sony Silver. She currently lives in Gloucestershire with her family and is at work on her second novel. I can definitely see why this book is a favorite for many. Told with many intricacies, that have you mind-bent at times. 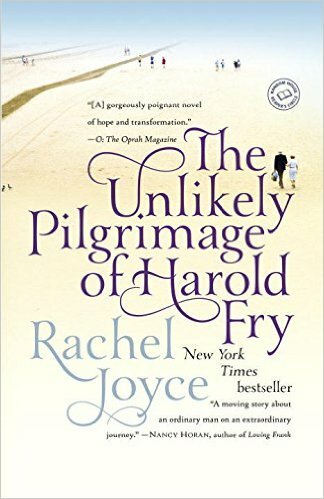 Was the journey Harold took crazy? You're damn skippy. Was it worth it? It definitely was. Even if it stopped being about what it was in the first place. I got nothing but mad love for Harold and Maureen. You think one thing and are going to be totally wrong... it is what it is... but you know this is a great thing, because what you're rooting for is even better than expected! Yeah, all I can say is, if you haven't read it. You really need to. Seriously. You and I both love this book. Nuff said. I've been meaning to read this. I think I should move it up the list!